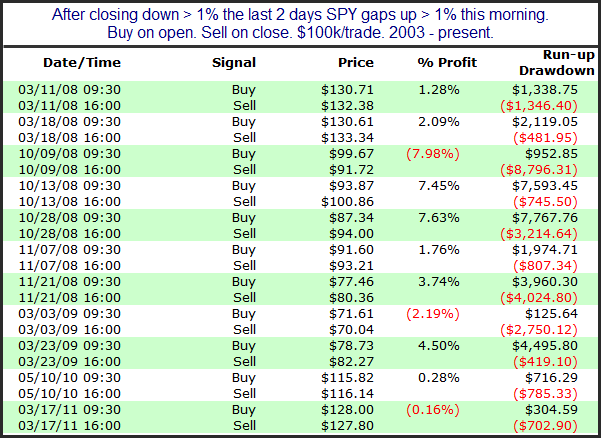 After 2 hard days of selling the SPY looks to be gapping up strong this morning. 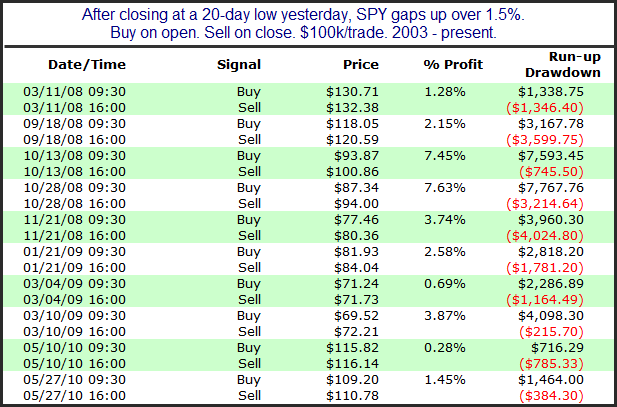 I looked back at other times that the SPY gapped up big after 2 large down days. 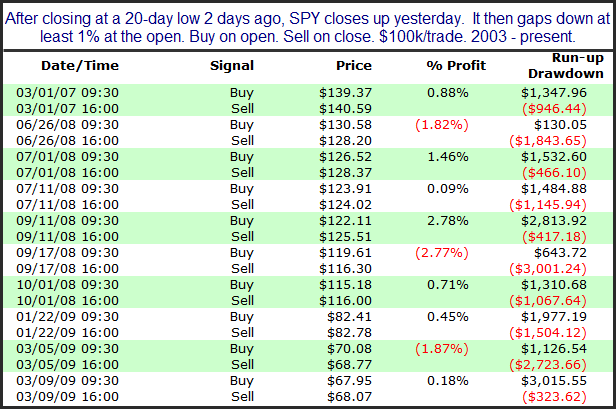 Below are the results since 2003 of buying all instances at the open and then selling at the close. There appears to be a bit of an inclination to follow through on the gap to the upside. Most of the instances were quite volatile, and all of them pulled back at least 0.4% below the open at some point during the day. Most of them also took place during 2008 when volatility (both intraday and overnight) was elevated. I haven’t shown an updated POMO chart on the blog in a while, and with QE2 now in the rearview mirror for the calculations I thought readers might find it interesting. POMO stands for Permanent Open Market Operations and it is how the Fed goes into the open market to buy securities. The net effect of this buying is an influx of cash into the system. It appears a portion of that cash makes its way to the stock market and works as a bullish influence. A “POMO Day” is simply a day where these operations take place. The chart below shows my POMO Volume indicator. The top pane is the S&P 500. The bottom pane is the total amount of money infused into the system (POMO buying) over the previous 20 days. The obvious takeaway here is that periods of heightened POMO buying have led to strong stock market rallies. Periods of weak or negative stimulus have been followed by market drops. This chart only goes back to 2008. For a longer view back to 2005 you may use the link below. Looking at the far right side of the chart you can see POMO volume has dipped substantially since the end of QE2 (end of June). It has now reached a level where it is expected to be maintained for the foreseeable future. In the past when POMO stimulus ended – it ended. 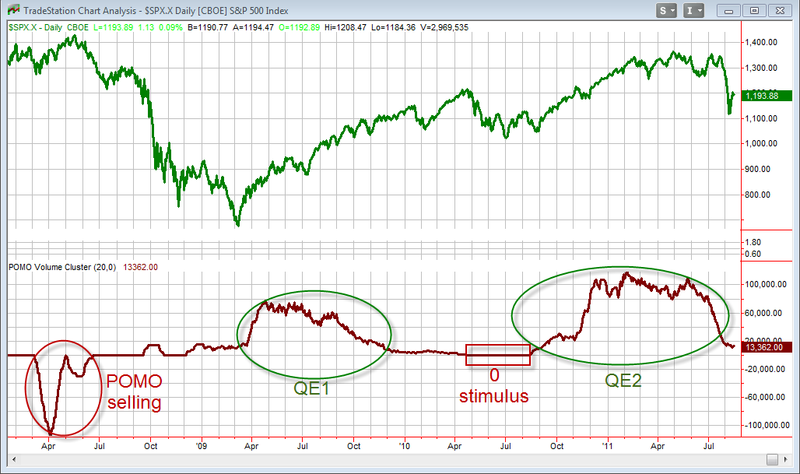 This time the end of QE2 has led to a period of substantially less stimulus, rather than none. This made it tricky in determining whether the end of QE2 would be followed by a sharp market drop. (It was.) While there IS still liquidity pumping going on, it appears the reduced level is akin to providing a heroin addict a couple of aspirin to try and get high. The link below shows the POMO activity schedule on the Fed’s website. This volatility continues this morning with a big gap down. 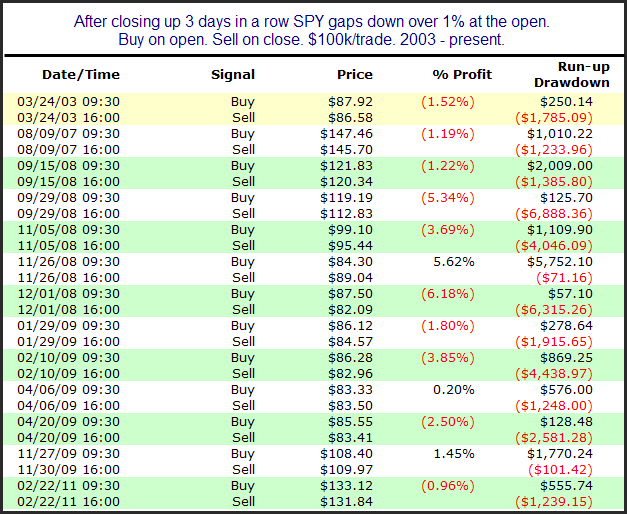 The study below shows performance for the day following large gaps that occur after 3 consecutive up days. These stats do not appear encouraging for the bulls. Below I have listed all instances. This view isn't any better. It appears there is some potential for another ugly day. I'd use caution buying today. This selloff is setting new extremes. Whether you look at volatility, price action, breadth, or volume, recent readings are off the charts. The table below is from last night’s subscriber letter. It highlights some of the extremes I noted in these areas on Monday. This morning I added a few filters and looked at just what might be expected on the day of the gap. This first study shows what has happened when the 2% gap down occured after a 100-day low. Low instances but a possbile upside tendency. But next is the bad news. 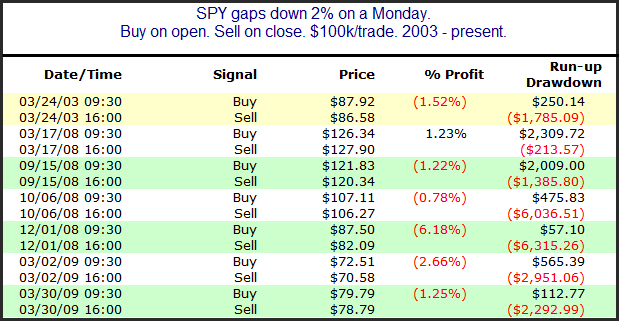 The study below looks at 2% gaps down on Mondays. Tough call this morning. I think we should see a bounce in the next few days, but it may not be immediate. I’ve discussed before the propensity for Tuesday to serve as a day where short-term selloffs reverse. Historically it has outperformed every other day of the week in this regard. 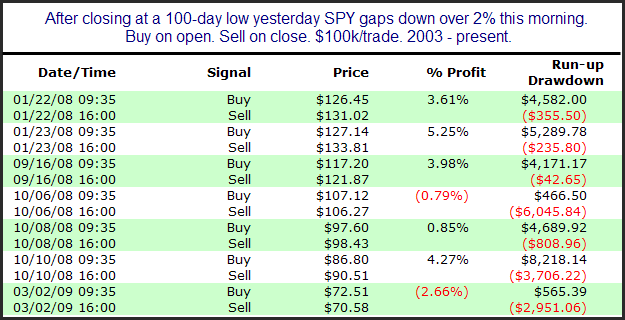 Last night I examined SPY performance following at least 5 straight down days going into Tuesday. Those results are below. 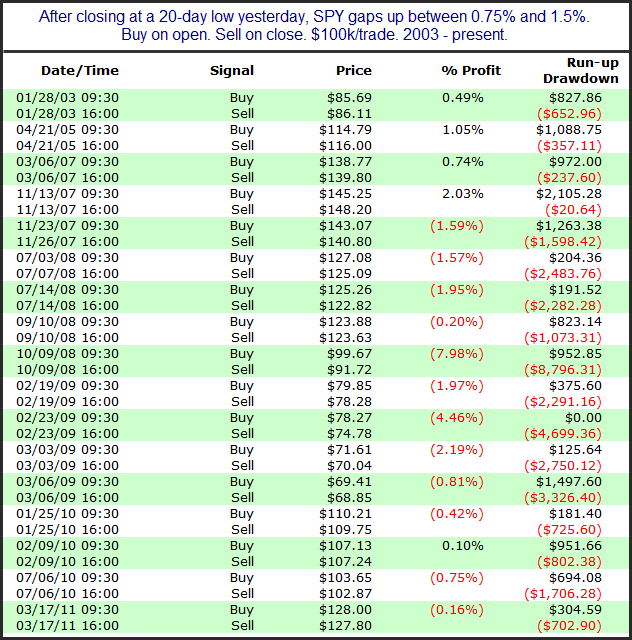 Instances are low but the stats are overwhelmingly bullish over the 1st 3 days. 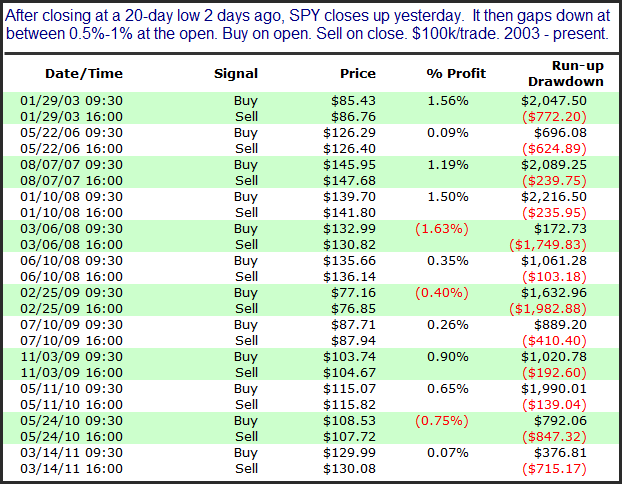 Of further note, all 10 instances managed to close above the entry price at some point in the next 3 days. So even when Tuesday failed, it was made up for on Wednesday or Thursday.